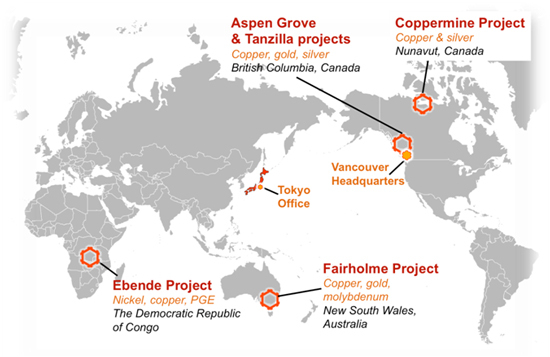 VANCOUVER, CANADA — Kaizen Discovery Inc. (KZD-TSXV) today announced the start of its Canadian 2015 field season, with initial mobilization and stakeholder engagement at the Coppermine Project in Nunavut and the beginning of fieldwork at the Aspen Grove Project in southern British Columbia. Details also are provided of the season's planned programs at the Coppermine, Aspen Grove and Tanzilla projects, and of recent drill results at the Fairholme Project. Figure 1. Locations of Kaizen Discovery's projects and offices. The Coppermine Project is an early-stage, district-scale exploration play in Nunavut, in northern Canada. Kaizen controls 100% of the project following its acquisition of Tundra Copper Corp. in November 2014. Following the acquisition, Kaizen staked additional Prospecting Permits and applied for permits on Inuit-Owned Lands (IOLs), yielding a total landholding of approximately 3,500 square kilometres (1,351 square miles). The tenements constitute a district-scale greenfields exploration prospect, covering approximately 115 kilometres of strike of an easterly-trending belt of Meso-Proterozoic continental flood basalts (the Coppermine River Group) and unconformably overlying marine sedimentary rocks of Neo-Proterozoic age (the Rae Group). The belt has numerous mineral showings and occurrences that demonstrate its prospectivity for two distinct deposit types: 1) sediment-hosted, stratiform copper-silver; and 2) structurally-controlled, volcanic-hosted copper-silver. 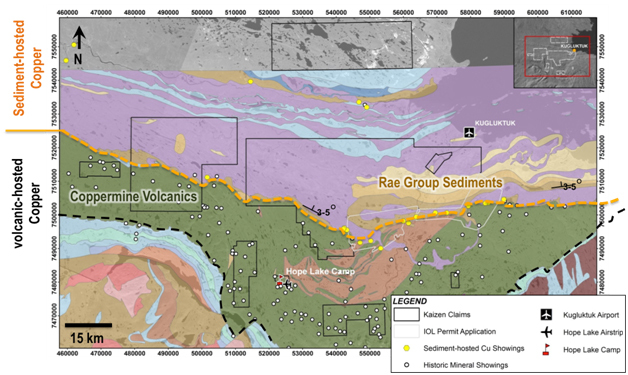 Kaizen's planned 2015 exploration program includes regional mapping, sampling and diamond drilling of both the volcanic- and sedimentary-hosted stratiform targets. Permit applications have been submitted for drill holes within the basal part of the Lower Rae Group to test the presence and continuity of previously identified stratiform copper mineralization. Drill permit applications also have been submitted for holes proposed within the Coppermine River basalts, which will test the vertical and strike continuity of high-grade, volcanic-hosted copper mineralization. Initial mobilization of fuel and camp supplies to an existing airstrip within the project area has been completed. Final mobilization and start-up of field operations are scheduled for early June, assuming all required stakeholder approvals and permits are received. Details of the proposed Coppermine exploration program recently were presented by Kaizen's President and CEO B. Matthew Hornor to the Nunavut Mining Symposium in Iqaluit. Kaizen also held meetings with local stakeholders in Kugluktuk, the community closest to the project area, and Iqaluit. Members of the Japanese business community and a representative from Japan Oil, Gas and Metals Corporation, the government entity responsible for securing Japan's natural resource supply, also attended the conference. Mr. Hornor commented, "We are very encouraged by the interest and support shown for our Coppermine Project, which will be one of the few active exploration projects in far western Nunavut this year. We are looking forward to starting field operations and hosting our Japanese partners and interested parties on site, and expect to finalize additional project financing for this district-scale initiative." Figure 2. Geology map of Kaizen's Coppermine Project, showing locations of the two types of exploration targets: sediment-hosted stratiform copper in Rae Group sediments and volcanic-hosted copper in the Coppermine volcanics. The Aspen Grove Project is comprised of 29 claims (112 square kilometres/42 square miles) that are 100%-owned by KZD Aspen Grove Holding Ltd., a subsidiary 60%-owned by Kaizen and 40%-owned by ITOCHU Corporation of Japan. Aspen Grove is located between the Highland Valley and Copper Mountain mines at the southern end of British Columbia's copper-rich Quesnel Trough. The property covers part of an extensive belt of porphyry copper mineralization hosted by Upper Triassic Nicola Group volcanic rocks and Late Triassic to Early Jurassic intrusions. Kaizen and its joint venture partner, ITOCHU, plan to expand the exploration of the Par prospect and begin exploration of two new areas: the Ketchan Lake and the Boss/Zig/Thalia (BZT) prospects. The 2015 program will include a 3D induced polarization (IP) survey to be conducted by SJ Geophysics, a 7,000-metre drill program, and further mapping and sampling of the prospects. The program is fully funded through ITOCHU's $4.0 million investment completed in 2014. The 3D IP survey began on April 15 and is expected to cover a total of approximately 15 square kilometres (5.8 square miles), including the extension of the Par prospect, followed by the Ketchan Lake and BZT prospects. 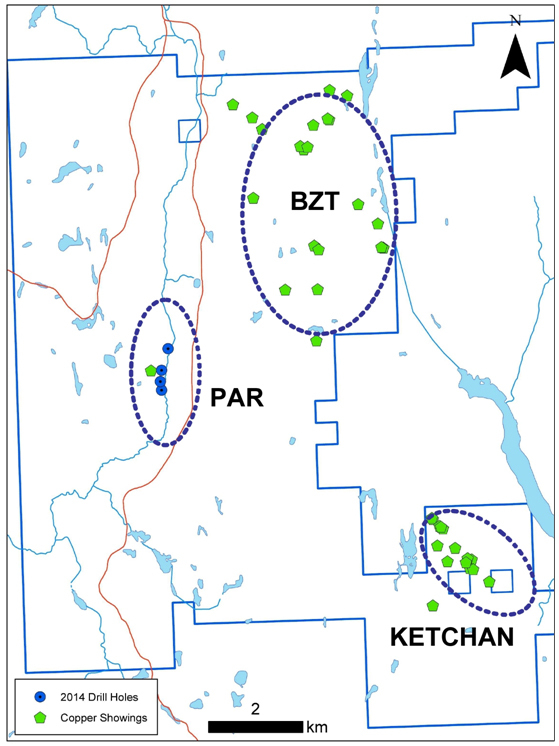 The 7,000-metre drill program is planned to start in early June and will test anomalies from the 2014 3D IP survey at the Par prospect and its extension to the northeast, and investigate historic results and any new geophysical IP anomalies identified within the Ketchan Lake and BZT prospects. "We are pleased to be back in the field and kicking off our 2015 field season at Aspen Grove, with a significant greenfields drill campaign in a prospective part of southern British Columbia," said Kaizen's EVP Exploration, Dr. David Broughton. Figure 3. Outline of Aspen Grove claim with main prospects to be explored in 2015. BZT refers jointly to Boss, Zig and Thalia prospects. The Tanzilla Project is located in northwest British Columbia, approximately 20 kilometres southeast of the community of Dease Lake. The project is comprised of 26 claims (80 square kilometres/31 square miles) that are 100%-owned by Kaizen. The program is being funded by Freeport-McMoRan of Canada Limited (Freeport), a wholly-owned, indirect subsidiary of Freeport-McMoRan Inc., as part of an earn-in agreement. Freeport can earn an initial 51% interest by funding cumulative expenditures of $8.0 million over a four-year period. Kaizen is the operator under the agreement. Tanzilla is situated within the east- to northeast-trending Stikine Arch, where mid-Paleozoic to Middle Jurassic arc volcanic and intrusive rocks host a number of productive porphyry and epithermal systems. The property covers a seven-kilometre-long alteration zone associated with anomalous copper, zinc, lead, gold and silver values in rocks. Previous work identified chalcopyrite-bearing, altered porphyritic intrusive rocks in creek and gulley outcrops near the base of Silica Ridge. Three holes were completed in 2014, one of which (TZ14-05) bottomed in more than 400 metres of intense advanced argillic to phyllic-altered breccia and widespread copper-molybdenum mineralization. A drilling budget for 1,500 metres has been approved for 2015. "These initial drill results are consistent with an altered lithocap over a significant buried porphyry system," Dr. Broughton said. "We're looking forward to working with Freeport to test this target during the upcoming field season." Figure 4. Drill plan for 2014 program at Tanzilla Project, showing large chargeability high. Drill hole TZ14-05 intersected more than 400 metres of advanced argillic and phyllic alteration with associated weak copper-molybdenum mineralization, interpreted as an extensive lithocap over a buried porphyry system. Follow-up drilling is planned for 2015. The Fairholme Project is located within the Macquarie Arc, which hosts multiple porphyry copper-gold deposits, including Cadia and Northparkes. 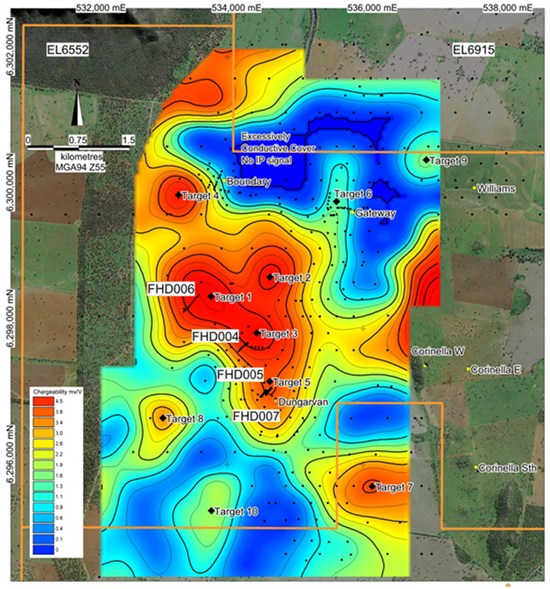 The southern part of the project area contains the Boundary, Dungarvan and Gateway prospects that are associated with highly anomalous basement copper-gold-molybdenum geochemistry, as well as discrete magnetic anomalies. Historic drilling by Newcrest Ltd. encountered mineralization and alteration consistent with a porphyry copper system. Kaizen earned a 49% interest in the Fairholme Project in January 2014 and, under the terms of the earn-in agreement with operator Clancy Exploration, can earn up to a 65% interest in the project by incurring exploration expenditures of A$4 million before December 31, 2015. Since January 2014, Kaizen and Clancy Exploration have completed a helicopter-borne magnetic survey over the entire property, a 3D IP survey and most recently a 2,453-metre diamond drill program. The project area is largely covered by thick, electrically conductive overburden, which is a barrier to traditional IP methods. The 2014 3D IP survey was conducted using HPX TechCo's proprietary TyphoonTM system over an area of 31 square kilometres (12 square miles) encompassing the Boundary, Dungarvan and Gateway prospects. 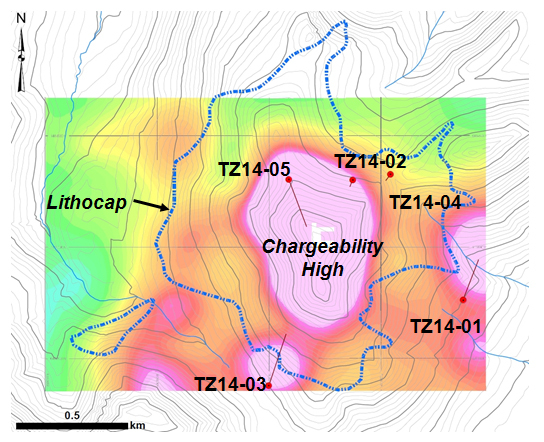 Ten chargeable IP anomalies below the conductive overburden were defined by the survey, three of which (T1 to T3) form a large (2 x 2 kilometre) chargeability cluster between the prospects. A nearby chargeable anomaly (T5) is associated with geochemical anomalies at the Dungarvan prospect. Four drill holes were completed from mid-December 2014 through March 2015. Three holes tested Targets 3 and 5 coincident with the main magnetic-intrusive centre at the Dungarvan prospect (FHD004-5 and FHD007). Drill hole FHD006 tested the magnetic low adjacent to Dungarvan. The drill holes over the Dungarvan prospect intercepted an extensive porphyry system associated with the main magnetic high centre. Rocks encountered included monzodiorite, intermediate feldspar-hornblende porphyry, intermediate feldspar porphyry and diorite intrusions hosted by an intermediate package of bedded, matrix-supported polymictic conglomerate and medium- to fine-grained volcaniclastic rocks. Hole FDH006 encountered well-bedded fine- to medium-grained volcaniclastic rocks with lesser conglomerate and minor feldspar porphyry intrusions. The drill holes intersected minor copper-gold mineralization within a broad zone of disseminated iron-sulphide-bearing volcaniclastic rocks, considered the source of the chargeability anomaly. A large part of the project area remains insufficiently explored under cover, and a project review is underway. Figure 5. Plan view of the southern part of the Fairholme project area, showing the 3D chargeability model sliced at -450-metre depth, and the locations of the 10 targets (contoured at 0.5mV/V intervals) with respect to the drill collars and prospect locations. The Ebende Project is a greenfields exploration project consisting of 17 contiguous and near-contiguous licences located in the Eastern Kasai and Katanga Provinces of the DRC, 100%-owned by Kaizen. Kaizen recently filed for relinquishment of 50% of the licence area following expiration of the first, five-year tenure period, as required by DRC law. The Ebende Project is underlain by a regional-scale belt of mafic volcanic rocks adjacent to a cratonic boundary. The geological setting is considered to be conceptually prospective for magmatic deposits of nickel, copper,and platinum-group elements. Previous exploration work included aeromagnetic, gravity, stream geochemistry and TyphoonTM IP surveys, as well as preliminary diamond drilling. Initial regional stream-sediment sampling highlighted an area with elevated nickel, copper, platinum and palladium. In 2014, Kaizen contracted a second TyphoonTM survey and a soil geochemical survey to follow up on this area. Copper-in-soil anomalies coincident with chargeable zones along the footwall of the Ebende volcanics warrant drill testing. No significant mineralization has been intersected to date. Kaizen is considering funding options to advance this project. The scientific and technical information for the Coppermine, Aspen Grove, Tanzilla and Fairholme projects in this release has been reviewed and approved by John Bradford, a Qualified Person under the terms of National Instrument 43-101 (NI 43-101). Mr. Bradford has verified the data disclosed in this news release. The scientific and technical information for the Ebende project in this release has been reviewed and approved by Michael Lynn, a Qualified Person under the terms of NI 43-101. Mr. Lynn has verified the data disclosed in this news release. Independent NI 43-101 Technical Reports for the Ebende and Fairholme projects are available at www.kaizendiscovery.com and www.sedar.com. Kaizen is a Canadian technology-focused, mineral exploration and development company. Kaizen entered into a collaboration agreement with ITOCHU Corporation of Japan in January 2014 and has access to HPX TechCo's proprietary geophysical TyphoonTM technology under a dedicated services agreement. Kaizen's long-term growth strategy is to work with Japanese entities to identify, explore and develop high-quality mineral projects that have the potential to produce and deliver minerals to Japan's industrial sector. More information on Kaizen is available at www.kaizendiscovery.com. Statements in this news release that are forward-looking statements are subject to various risks and uncertainties concerning the specific factors disclosed here and elsewhere in Kaizen's periodic filings with Canadian securities regulators. When used in this news release, words such as "will, could, plan, estimate, expect, intend, may, potential, should," and similar expressions, are forward-looking statements. Information provided in this news release is necessarily summarized and may not contain all available material information. Forward-looking statements may include, without limitation, statements regarding the planned 2015 exploration programs at Kaizen's Coppermine, Aspen Grove and Tanzilla projects; statements regarding the expectation to finalize financing terms for the Coppermine Project; statements regarding the number of metres that are planned to be drilled at the Aspen Grove and Tanzilla projects; and statements regarding Kaizen's long-term growth strategy to work with Japanese partners to identify, explore and develop high-quality mineral projects that have the potential to produce and deliver minerals to Japan's industrial sector.